Is SME Server ready to roll? Review: SME Server is pretty much the original ready-rolled server distribution. Although it has changed hands – and names – a few times, it's been around since 1999, when it was known as e-Smith, a name you'll still see in a few places. 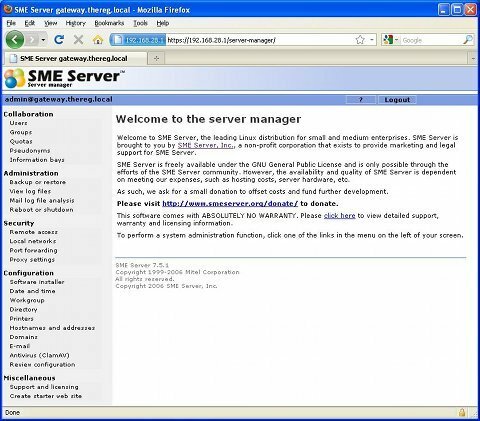 In 2001, SME Server was bought by enterprise VOIP vendor Mitel, which for a while offered unified office servers based around e-Smith, which it renamed Managed Application Server. Mitel donated the product back to the community in 2004, where today it is developed cooperatively by a community based around the contribs.org website – originally a home for third-party extensions to the software. Originally based on the old free version of Red Hat Linux, its developers have now moved SME Server over to CentOS, a de-branded Free version of Red Hat Enterprise Linux. (For additional big-corporate kudos, it's worth knowing that Oracle Unbreakable Linux is essentially CentOS, re-rebadged.) This puts SME Server on a solid base and also permits easier updates. The current version of SME Server is 7.5.1, based on CentOS 4.8, SME Server 8 is in late beta and will be based on the current CentOS 5.5. The installation is very straightforward and asks few questions apart from a password. This is the password both for the standard Linux "root" account and for the management interface's "admin" account, too. A media check of the installation CD is optional and there are no partitioning options – it always takes the entire hard disk of the PC being used, removing any and all existing data. Dual-booting is not an option, so don't even try – it's all or nothing. If you have a static IP for the machine, you can enter it, or it will happily pick one up from a DHCP server. The sole option concerning disk utilisation becomes available if the server has multiple – ideally identical – hard disks, in which case SME Server will automatically create a software RAID1 pair, turning two or more drives into a mirrored array. Every install is a full install, with no option to disable any parts of the system that you might not want or need. It's all or nothing every time, and everything is always turned on. Even if you don't need a web server, say, Apache will be running in the background nonetheless. If you're willing to go in and edit some configuration files, it's possible to disable certain services, but it's much harder than it should be. The only real installation option is the type of server, of which there are three: "server and gateway", "private server and gateway" or "server-only". Except in "server-only" mode, SME Server expects to be the Internet gateway for your LAN. It wants two Ethernet connections – one to the Internet and one for the internal network. In "server and gateway" mode, it expects one of its ports to be on the public-facing Internet, for which it will be the router and firewall. This allows it to serve web pages to the Internet, including its webmail service, and act as a VPN endpoint. In "private server and gateway" mode, the behaviour is much the same, but no services are available from outside the network – it even blocks Ping requests. "Server-only" mode works with a single Ethernet card, omits the firewall and routing functionality and must be protected behind a separate firewall – which is much simpler, but offers a lot less functionality. Services available to local users on the LAN are the same whatever role has been selected, so for example Web pages can be served internally for an intranet. By the way, if you're still using something as Palæolithic as dial-up, SME Server still supports that: it can use a modem as the Internet interface and will demand-dial your ISP as required.